Wes Falor, possibly his high school graduation photo around 1962-3. [S71] Camille Falor, "Camille and Derrek Falor's Email," e-mail to Kenneth Falor, Friday August 11, 2006. 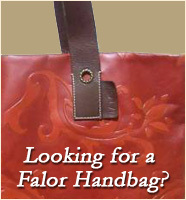 [S46] Interview, Ralph Falor, Sunday November 13, 2005. [S1] Personal knowledge of Kenneth Falor, 14 Mar 2005. [S121] Ralph Leland Falor 1935 - 2018, March 31, 2018. [S25] 1880 US Census, , United States Census. 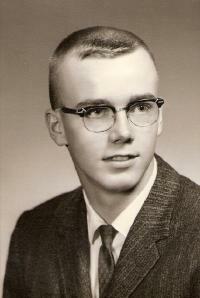 William A. Falor, 78, passed away Sept. 4, 1999, at his residence. He was born in Akron and was a life resident of the area. Mr. Falor was owner-operator of both the William A. Falor Agency and the Covered Bridge Lounge, which he had had for 34 years. William belonged to many organizations, Akron Touchdown Club, Joppa Lodge 666 F&AMJ, Bath-Richfield Kiwanis (founding member), High Street Elks Club of Akron, past president of the Pi Kappa Epsilon Fraternity (Lone Star) of the University of Akron, where he played basketball. He also played basketball for the Goodyear Wingfoot Team. Bill was the founding publisher of the Summit County Historical Society calendar, co-founder of the Old Time Athletes, co-founder and past president of Dapper Dan, where he was a recipient of the Andy Palich Memorial Service Award from the Summit County Sports Hall of Fame, and belonged to the Bethel Lutheran Church of Bath. He is survived by wife, Jean; son, Russell of Tampa, Fla.; daughter, Diann (Lou) Sullivan of Akron; grandchildren, Benjamin, Jennifer, Robert, Michael and Rachel. 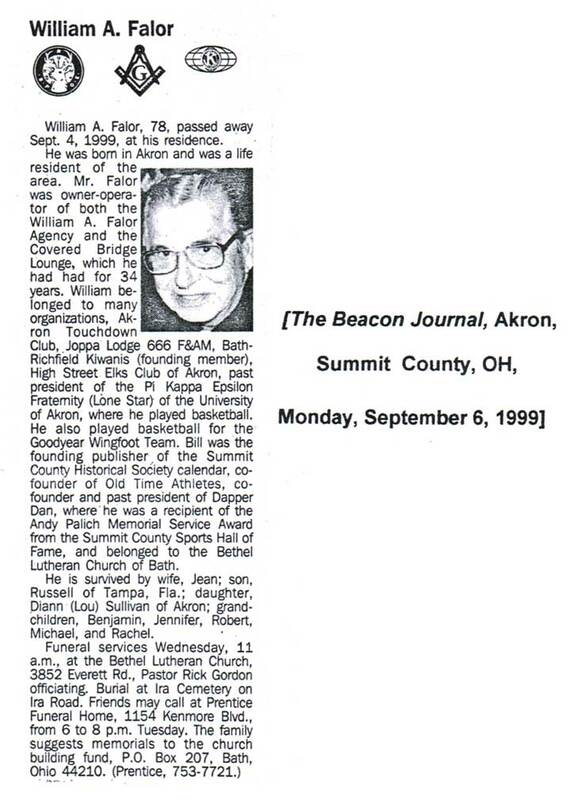 [S37] William A. Falor's Obit, Monday September 6, 1999. [S116] Jen Orum kardex, Glendale Cemetery, Glendale Cemetery, Akron, Summit County, OH, USA. [S89] Dan Coughenour, "Dan Coughenour's Email," e-mail to Kenneth Falor, Saturday, April 24, 2010 3:21 PM.